I had to interrupt regular posting to spread the word about an incredible breakthrough in lathe cutting from Mike at PIAPTK records. Mike texted me photos of this ten inch one evening and I don't think the reality completely hit me until this morning. There are five tracks on this 10" lathe cut in olympic circles that continue to play straight through the grooves on the other tracks. 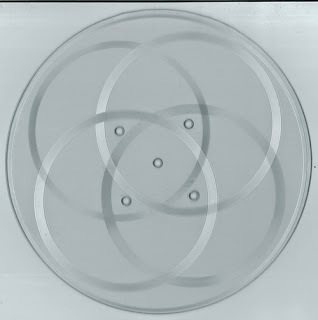 You have to cycle through the five 'center' holes to hear each separate track. Each song is effected by the other tracks, the best part being that this could only be done in this format and by someone with pretty intense lathe cutting skill. That would be mind blowing enough but Dimitri Manos, the electronic manipulator from Dr. Dog has composed the tracks to incorporate this chirp as the songs cut through one another and the tracks end in locked grooves. No samples of this anywhere but this sells itself, a completely unique one of a kind artifact that - oh yea - is a record that plays music. It's hard not to frame this thing and hang it on the wall. Mike also says this is only the beginning future shapes and they get more insane from here. I worry about him.